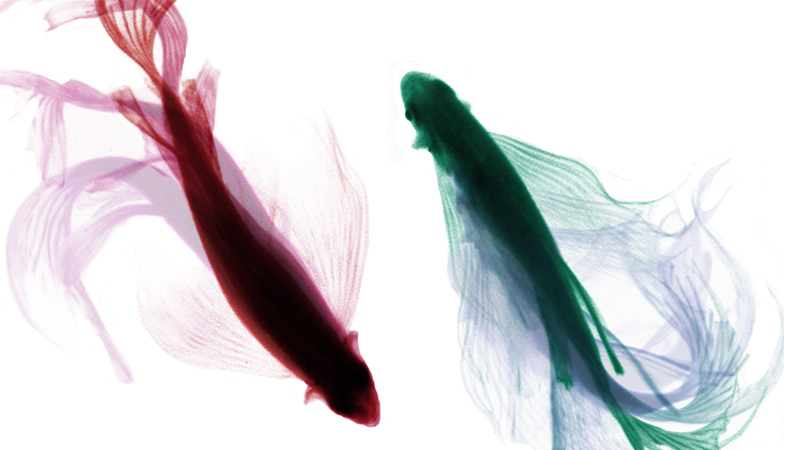 UO scientists have found brain cells needed for zebrafish to socialize. It’s a discovery that could help establish the small fish as a model organism for advancing research on autism spectrum disorders and schizophrenia, said Philip Washbourne, a professor in the Department of Biology and member of the Institute of Neuroscience, who has studied autism genes for almost two decades. When the cells, in this case neurons, are disabled, the way two zebrafish engage with one another breaks down similarly to socialization problems seen in human diseases. The neurons involved have equivalent genes in mice and humans. The research, funded by the National Institutes of Health, is detailed in a paper published online July 26 in the journal Current Biology. Early in the study, Washbourne’s doctoral student Sarah J. Stednitz noticed a pattern of behavior between two fish interacting socially. When placed in adjacent tanks they engaged in a get-to-know-you swimming pattern, as shown on the video below, despite the presence of a clear dividing panel between the fish. The observation prompted the research team to apply a drug known to impair neurons needed for social interactions in mice. They saw expected behavioral disruptions in the drugged fish, but they also witnessed a change in orienting behaviors by healthy fish. As the project progressed, fish were exposed to other objects, which failed to initiate social orienting. The research team concluded that zebrafish copy each other’s motions and are dependent on another socially engaged fish to begin social orienting. The presence of another fish that is not socially engaged fails to trigger interaction regardless of their proximity. The neurons are in a region of the fish brain that is theorized to be the evolutionary and functional equivalent for the regulation of memory, emotion and social behavior in mammals. The study came amid a shift of autism-related research in Washbourne’s lab. “We’ve been studying genes associated with autism and how they might work at the synaptic level in zebrafish,” Washbourne said. “We’d done a lot of that in the spinal cord, but it wasn’t very satisfying, because, in the end, people with autism don’t have deficits in very simple reflexes. For the research, the UO team developed new software to help measure the orientation of fish during social behaviors of some 500 zebrafish. Stednitz, a Montana native who came to the UO to work with Washbourne after earning a master’s degree at Humboldt State University, now is working with mutated genes in zebrafish that may be the equivalent to mutated genes in humans to see if the fish have deficits in social behavior and are, in essence, autistic. “If and when we have a mutant zebrafish that has deficits in social behavior, then we can ask, what can we give that fish to improve its social interaction? That could lead to drug screens and testing,” Washbourne said. Other co-authors on the study — Forebrain control of behaviorally-driven social orienting in zebrafish — were Erin M. McDermott, Denver Ncube, Alexandra Tallafuss and Judith S. Eisen, all of the UO Institute of Neuroscience.